Over the last couple of years, I have moved to a theme for the year -- one word that I want to live by and remind myself to work towards throughout the year. In 2013, it was DISCOVER. In 2014, I worked towards RESOLUTION. For 2015, I have struggled to find the right word, but now I believe that I have found it . . . 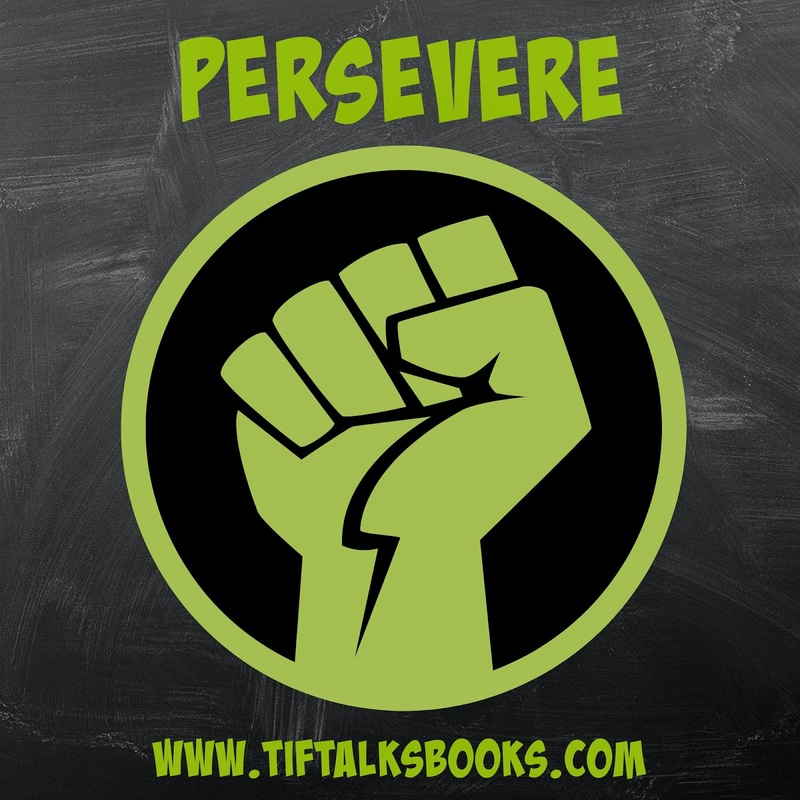 According to dictionary.com, persevere means . . .
to persist in anything undertaken; maintain a purpose in spite of difficulty, obstacles, or discouragement; continue steadfastly. The latter half of 2014 found me struggling with health issues that trickled into a lot of other areas: personal and professional responsibilities, reading, writing, and more. After a lot of conversation, I made the decision to resign from my job, get healthy, and re-evaluate my personal and professional goals. That's where PERSEVERANCE is really going to come into play. I need to figure out how to maneuver through all these obstacles and continue to move forward, possibly on a completely different path. That's a big word, so let's take a look at some smaller goals that I hope to tackle along the way in 2015 . . .
GET HEALTHY: For me, this means being more conscientious about the food that I eat, how I eat throughout the day (shooting for smaller, more frequent meals), and increasing my exercise. Sadly, my regular workouts were one of the first things that disappeared when I started that job. These need to return. READ MORE: I found myself not reading for days on end towards the end of the year. This is not normal for me and I found that the lack of reading impacted me tremendously. Reading every day, even if it is for 5 minutes will help to improve my mind and mood. I also want to continue working on the dozens of series that I am currently in the middle of. WRITE MORE. I love to write, and I want to do more of it. I want to get back into freelance writing. I want to finish a novel. I want to try my hand at short stories again. Thankfully, I have an amazing online writing group to help keep me motivated, accountable, and excited! BLOG CONSISTENTLY. I want to get back into a regular blogging schedule, sharing new posts, reviews, discussions, etc. at least 3 times per week. I plan to continue my weekly ramblings in Monday Maunder. I am excited to continue sharing some of my photos through Wordless Wednesday. I will also share my Literary Link Love once a month. Beyond that, you can expect book reviews, discussions, participation in bookish events, and anything else that may come to mind. When I look at all of this, I think it is feasable. I can do this. I can and will PERSEVERE. What is your one word for 2015? What about your goals? This is totally the word Bryan suggested for me for 2015! I agreed, so how very cool! We will persevere together! Good word. I've been wondering (and waiting for, tap, tap, tap ;) ) what your word would be. I'm on board with all four of your goals as I want to do each of those too. Good luck on...well...persevering. Bryan G. Robinson ... I apologize for causing you to sit in anticipation so long! ;) Thanks for the good luck! I may need it!! What a bold word!! I know you, like me, had trouble coming up with one. I think this is an excellent choice. I still don't have mind. LOL. It's becoming a thing. I love the idea of choosing a word for the year, but I can never think of a good one for myself! Your choice is excellent, though. Jenny @ Reading the End ... Thank you! The first year I did this, it was hard to come up with something. It doesn't really get easier, but I really do enjoy it. It is something that sticks with me throughout the year. Great word! It's definitely a big word, but there's so much power to it! This is a fantastic word! So many of your goals resonate with me. I may have to use this word next year! That is an excellent word. It immediately conjures a can-do attitude too. I love it! You can go this. :) Good luck to you in reaching all of your goals. I think my word for this year shall be ACTION. Simply because I need to take more action in a lot of areas in my life instead of sitting back and letting things happen. Ally R. ... Thank you! I love the word ACTION too! Good luck in taking action this year!